“But the tide (which stays for no man) calling them away, that were thus loath to depart, their Reverend Pastor, falling down on his knees, and they all with him, with watery cheeks commended them with the most fervent prayers unto the Lord and His blessing; and then with mutual embraces and many tears they took their leaves one of another, which proved to be the last leave to many of them.” — Excerpted from the Wall Street Journal’s “The Desolate Wilderness,” which has been published for Thanksgiving every year since 1961. It is based on governor William Bradford’s account of the early history of Plymouth Colony. Before too long, Thanksgiving Day will once again be upon us. Although there are a lot of things going on in the world that are disquieting, most Americans still have a lot to be thankful for. Thanksgiving is by far my favorite holiday of the year. I’m comforted by the thought of being surrounded by my family no matter where we happen to celebrate the day. There is also comfort in tradition: family recipes, the menu, the stories around the fireplace, the laughter, the giving of thanks before the grand meal, the pie! Setting aside a special day to show gratitude for our blessings is a tradition in America that goes back almost 400 years. For me, Thanksgiving has become a time to revisit the story of those first Pilgrims, who in 1620, risked everything, including their lives, to start a new life in the desolate wilderness that was America. What drove these Pilgrims? Why were they willing to take leave of many of their loved ones in Europe and abandon the comforts of civilization in order to make a treacherous 2 month + voyage across the Atlantic ocean? It was an opportunity. The Desolate Wilderness offered the Pilgrim an opportunity to worship God in accordance with his or her conscience and without fear of persecution. That opportunity did not exist in Europe. The New World held promise. 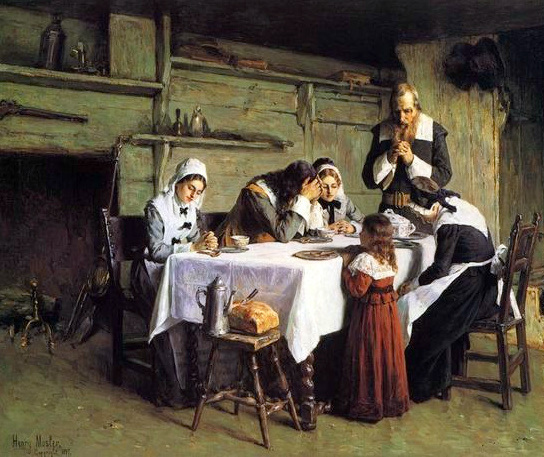 The Pilgrims’ misguided policy of owning all property in common proved to be a disaster. What was Robertson referring to when he compared the Pilgrims’ plight to the “same fatal effects” in the Virginia settlement? Let’s have a look at his history of the Jamestown colony, founded in 1607. How is it that very few of us have ever even heard about this part of our American history? Why don’t the government-run schools teach these lessons to our children? It seems to me that important parts of our early history have been suppressed. We need to revive them. Robertson’s History clearly demonstrates that the colonists’ experiments in communism were a failure. But once capitalism was introduced, or the right to accumulate private property, an incentive was created to produce more than one could consume and the colonists began to prosper. That is because the right to ownership of the fruits of one’s labor creates an incentive to work harder; it holds out the possibility of building a better life and empowers people to achieve prosperity on their own. On the other hand, collectivism breeds laziness and stifles human potential because the most productive workers have no incentive to produce more than what the average workers produce when all is divided equally among the community. The collectivist arrangement of society ignores the power of incentives and even human nature itself. Therefore, experiments in collectivism will never succeed beyond the family unit. It nurtures the destructive idea in some that by right they are entitled to benefit from the production of others. They seek advantage by taking more from the common pool than they contribute to it. This idea spreads like a cancer. Their more productive neighbors see this and become resentful. They in turn make the conscious, micro-rational decision to produce less. We see this process happening in the United States today. This may be one reason businesses both large and small are doing very little hiring these days. Hardly anyone gains under this arrangement and almost everyone loses. The Pilgrims learned the hard way that collectivism rendered them poor and devoid of even the bare necessities of life. Collectivism or communism did not work back then, it did not work in the Soviet Union, it does not work in Cuba and it will never work anywhere that it is tried. It’s important that we all make the effort to teach this truth to our young people. Since human nature does not change, collectivism will never succeed. Nor will its ability to tempt succeeding generations disappear. Perhaps in a future post I’ll explore the mutations of collectivism that exists in the United States today. This entry was posted in CURRENT EVENTS, History and tagged collectivism, communism, History of America, Jamestown, Pilgrims, Plymouth, Thanksgiving, William Robertson by eburke93. Bookmark the permalink.